Tiger Woods was back in action at the WGC-Bridgestone in the latest of many returns from absence. Photo copyright Icon SMI. We’ve been here before: Tiger Woods returns after an enforced absence from the Tour. It started at the 2008 U.S. Open, which he entered having not played since the Masters two months earlier due to knee problems that would require surgery. He won that one, but it’s been downhill from there. Next came the WGC-Accenture Match Play Championship in February of 2009, following an eight-month layoff due to major knee surgery right after that U.S. Open win at Torrey Pines. Amidst a media frenzy, he lost in the second round. After that it was the 2010 Masters. Amidst even more of a media frenzy, considering that he picked the most prominent tournament in the world to come back from a four-month scandal- and rehab-induced absence, he finished fourth. Then came the 2010 Memorial. 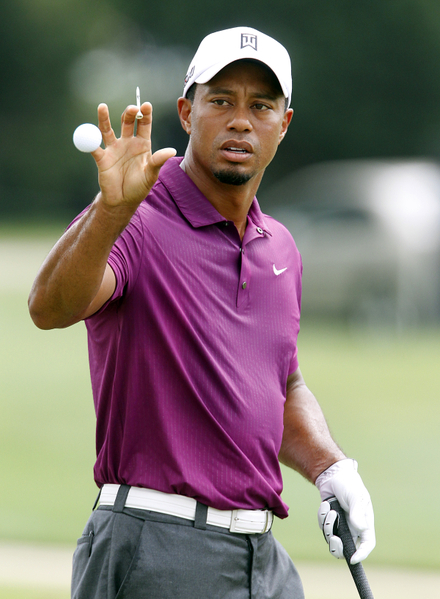 A month earlier, Woods had withdrawn from the Players Championship with a neck injury. Nobody knew how long he would be absent; it turned out to be four weeks. He finished 19th. Next on the list was the 2011 Players Championship. Woods suffered what he termed “mild” injuries to his knee and Achilles during the Masters a month earlier, but when he showed up at the Players he revealed that he had only just started hitting balls. Despite pronouncing himself fit, he noticeably limped through the first nine holes and withdrew. Last week it was the WGC-Bridgestone Invitational. After the Players, Woods missed two major championships and gave no true indication of his condition or when he might return until just before. It had been nearly three months since the Players, with only nine holes of tournament action in the four months since the Masters. He finished 37th. There was less fanfare this time, probably because of what might be called comeback fatigue. And also because we didn’t really expect to see anything except an ordinary golfer at the Bridgestone. Not that we think it will be impossible for Woods to become a force again, but there was no reason to think it would happen after a long layoff—not to mention the swing change that has yet to take hold or the putting that has become mediocre in the last couple of years. Of course, it’s hard to build continuity in your swing and putting stroke if you are constantly on and off. The most encouraging note for Woods was that he played four rounds without any physical problems (that we know of). If he can get off the stop-and-start cycle, the way is clear for progress. He had a lot of trouble finding the fairway (last in driving accuracy) and his game was erratic. No real surprise there. His putting was great the first day—maybe that practice when he was unable to hit balls paid off—but terrible the next two rounds and mediocre in round four. For the week, he was below average in strokes gained-putting. His work on the greens is still a question mark going forward. He was even testier than usual with the media. Short answers, condescending answers, downright b.s. answers, a bunch of “uh-uhs,” and a body language and tone of voice that intimated he would rather be trapped in a small room crawling with poisonous ants than answering reporters’ questions. Very little of what he said can be taken at face value. At his early-week press conference he said that he had been practicing for two weeks, something he gave no hint of in his website announcement and tweet the previous Thursday that he would be playing the Bridgestone. If not for the media’s sake, wouldn’t it make sense for him to let his fans in on information like that, rather than just saying he’s fit and ready to go? The fans remain solidly behind him. Despite negativity on Internet comment boards and, to a lesser extent, in the media, Woods always gets a positive reaction from the crowds at tournaments. That’s not just his hard-core of fans, but golf fans who want to see him perform great feats the way he used to. The unavoidable story line of the week was Woods’ former caddie Steve Williams winning on Adam Scott’s bag after Woods fired him. And the oddest thing about that was fans’ chanting Williams’ name as he walked the fairways down the stretch. Did Williams, heretofore known for a rather unpleasant disposition as Woods’ bodyguard, suddenly become popular? Maybe there was some sympathy for a man who had just gotten the axe, but I think it was just a matter of fans getting caught up in the story. And it really was a legitimate story, so CBS was justified in interviewing Williams afterward. For his part, Williams would have been better off keeping a low profile. Instead, he vented his anger at Woods by calling it the best week he’s ever had as a caddie. Granted, he might have been caught up in the excitement of the moment to a certain extent. But he had to know the portent of those particular words, “best week ever,” for a caddie who was with Woods for 13 major championships. Williams admitted on Monday to Robert Lusetich of Fox Sports that he was “a bit over the top” with his comments. He’s a blunt guy who is probably better off keeping his mouth closed and not becoming a distraction for his player. He knows that, and said he’s not going to say any more about Tiger. So, that’s a tempest that should die down quickly. More interesting is what will happen with Tiger Woods from this point. Will he finally get the reps he needs? The PGA Championship will tell the tale. He’s currently outside the top 125 and thus currently on the outside of qualifying for the four-tournament FedExCup playoffs, which start in two weeks. He’s 129th, so making the cut at the PGA should be sufficient to get him in, as long as he doesn’t finish at the bottom of the pack. He’ll need to move up to the top 100 to get into the second playoff event. He has said he won’t play in the Wyndham Championship next week, so a missed cut at the Atlanta Athletic Club would mean another enforced absence from the Tour by missing the FedExCup events. Oh, no, another Tiger Woods return from a layoff at the Frys.com Open in October? Or in the CIMB Asia Pacific Classic Malaysia at the end of October? We’ve already had enough of those.